The sun is unusually powerful on this Friday afternoon in early September and a hot wind is literally howling off a very choppy Lac St. Louis. No, we’re not on campus any more, Dorothy. We’re at the beautiful Beaconsfield Yacht Club for the McGill Sailing Team’s annual tryouts. On Day One of the three-day tryouts, some 40 sailors have turned up to secure one of the 18 spots on the sailing team roster. But landlubbers take note: there is such a thing as too much wind for safe sailing and, for now, those trying to make the cut will have to demonstrate their prowess on paper instead of on the water. They must return to sail their way to a spot on the team another day. 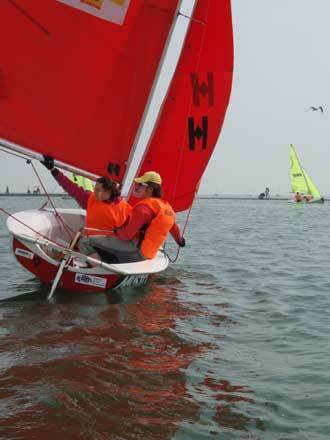 And that’s really what it’s all about for the members of the McGill Sailing Team – being out on the water. With no Canadian sailing league to compete in, McGill races in the New England Intercollegiate Sailing Association, the most competitive division of the Intercollegiate Sailing Association, U.S. college sailing’s national organization. Last year, McGill ranked 27th out of 38 teams in the coed category. But for the almost entirely self-funded team, it’s not about winning, it’s about camaraderie and the joy of sailing, feeling the wind in your sails in regattas all over New England against some the world’s strongest college sailing teams. This year, the prospect of sailing head-to-head against the likes of Boston College, Harvard, Dartmouth College, the Coast Guard Academy and MIT enticed a record number of students to try out for the team. The McGill team races in coed competitions in two-person dinghies called Club 420s. (College sailing races are “white sail” only, which means no spinnaker is used.) The team is broken into 18 pairs (skipper and crew) who take turns competing in weekend regattas hosted by a who’s who of college sailing. This year’s schedule will see two McGill boats in regattas in such sailing hotspots as Maine’s Penobscot Bay and Newport, Rhode Island. That means a lot of hours logged on the asphalt for the intrepid McGill sailors. Indeed, about half of the team’s 2008 budget of about $11,000 will go towards car rentals and gas, with an almost equal amount covering the cost of boat rentals and trainer’s fees incurred at the yacht club, where the team practices four times a week in the fall and spring. This year, there’s at least one regatta the team won’t have to spend much money or time travelling to. They host their own event, the McGill Cup, Oct. 25-26.
in the event, which draws teams from as far away as Australia, in both 2006 and 2007. Last year’s Wilson Trophy was won by the New York Yacht Club’s Silver Panda, who went on to claim both the U.S. National and World Championships. In an effort to further raise their profile in the McGill community (they were once asked if they trained in the pool), the team also offers sailing lessons. For more information on the team, regatta results and how to arrange a lesson, visit www.mcgillsailing.org.